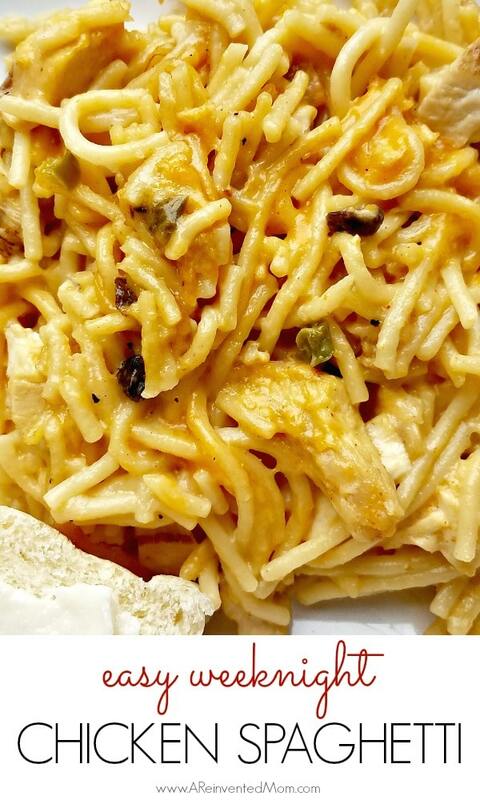 Easy Chicken Spaghetti – who says comfort food can’t be easy? A few shortcuts turn this much-loved recipe into an easy weeknight dinner for families. 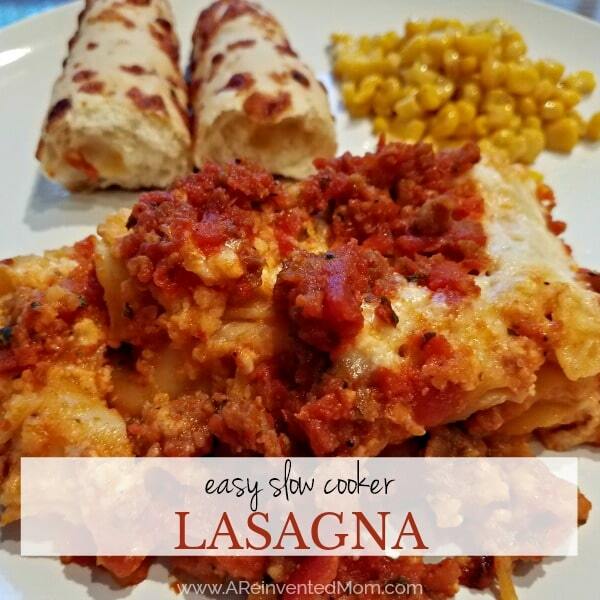 Like many of you, I am always on the hunt for easy meals to feed my hungry family. Especially simple recipes I can prepare during the busy week. Who has the time (or inclination) to spend hours in the kitchen after a long day of work and running kids around to activities? Not me. And I bet you don’t either. Until now, favorite comfort food recipes have been relegated to the weekend menu due to weekday time constraints. But what if we crave (or need) a little comfort food during the week? 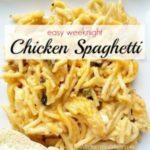 A couple shortcuts have transformed my Classic Chicken Spaghetti recipe into an easy weeknight option. And it’s done without compromising the flavor of the dish. The first shortcut is using pre-cooked chicken. This change is the key to lopping off about 30 minutes of cook time. I’ve successfully used batch-cooked chicken, rotisserie chicken and Kirkland brand Grilled Chicken Breast Strips from Costco. Next, use recipe-ready chicken broth to compensate for the lack of flavored cooking liquid. Can I substitute other soups? Yes, you can use 2 cans of cream of chicken or mushroom soups. Can I delete the onion and/or green pepper? Of course! If your people don’t like green peppers or onions, don’t use them. I forgot to reserve the half cup of pasta water – no problem. I can’t tell you how many times I’ve forgotten to save the water. Feel free to use warm tap water in a pinch. What is the reserved pasta water for? If the pasta mixture appears to be on the dry side, add some of the pasta cooking water. The dish should have a creamy consistency, but not too liquidy. Don’t be put off by the baking time – it’s all hands-off time, allowing you to prepare your side dishes or a quick salad. Or spend time catching up with your kiddos. Or simply unwind with a glass of wine after a busy workday. 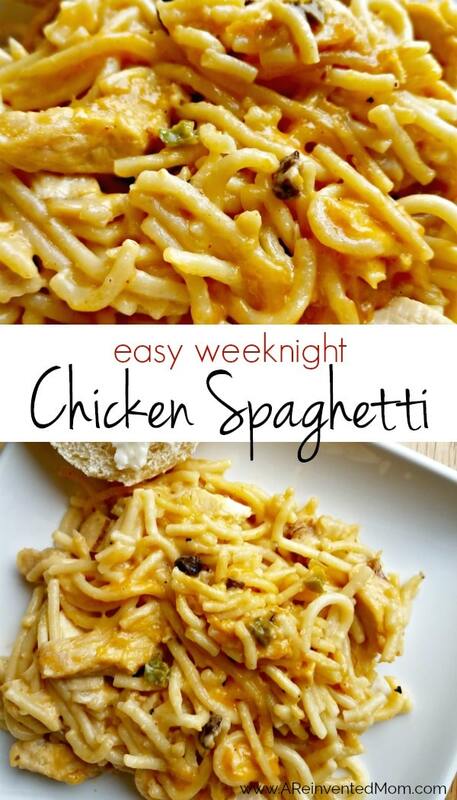 If you are faced with an extremely busy day or week, you can prepare Easy Chicken Spaghetti ahead of time. Prep the evening before or in the morning to lessen the dreaded after work scramble. And I’m all about doing things to make evenings less stressful. To prepare in advance, follow the steps up to baking. Cover the assembled dish and store it in the refrigerator until ready to bake. These casserole dishes with lids are fab for storing food in the frig. To bake, remove the casserole dish from the frig about 15 minutes before baking and set on the counter while the oven preheats. Remove the lid and pop the dish into the pre-heated oven. This recipe was originally posted on 1/29/17 and updated on 1/24/19. Share this recipe with a stressed-out Mama. I promise she (and her family) will thank you! Big mixing bowl – the right size for mixing ingredients for this dish. I’ve shared this recipe at Weekend Potluck, Recipe of the Week, Meal Plan Monday, Pretty Pintastic Party. 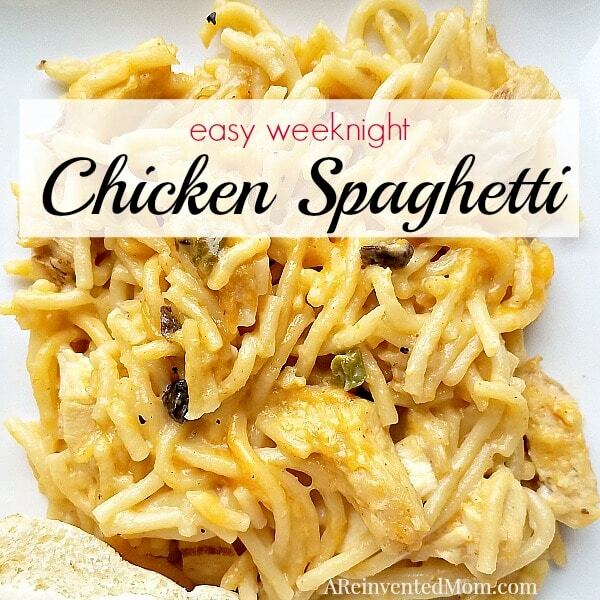 Easy Weeknight Chicken Spaghetti - who says comfort food can't be easy? I've simplified an ARM family favorite dinner to make it perfect for busy weeknights. Cook spaghetti according to package directions until al dente. Drain well. While the spaghetti is cooking, combine the pre-cooked chicken breast, 2 cans of soup, green pepper, onion, chicken broth, cheddar cheese (don't forget to reserve the 1/2 cup for later use), garlic powder and Lawry's Season salt. Mix well. 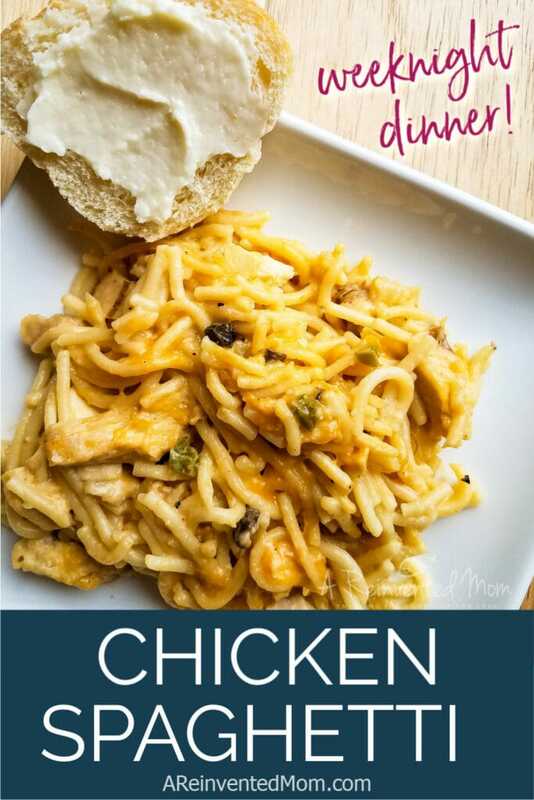 Easy Meal Prep Chicken works very well in this recipe. Rotisserie chicken works well with this recipe. Make ahead directions: recipe can be assembled the night before or in the morning and refrigerated until ready to bake. Remove casserole from frig about 15 minutes before baking. Bake as directed, allowing for additional baking time. The first time I made this was after Thanksgiving. Instead of chicken I used left over turkey – everyone loved it. Now this is my go to comfort food casserole. I find the best way to enhance all the flavors is use your chicken broth/stock for everything. I first boil my chicken and add some Better Than Bouillon Chicken flavor to the boiling water. When it’s time to boil my spaghetti noodles – I just heat up my chicken stock and cook my spaghetti in that. This way you have your 2 cups of broth for the casserole and some pasta water (mixed together). I’m not a big fan of cheddar cheese so I use Monterey Jack – perfect. What I love about a recipe is the ability to “make it my own” – our blogger shares her recipe and then we can add or delete ingredients to make it our own. Thank you this recipe b/c it really is one of my favorites. I used mushrooms instead of green peppers and 1 cup of chicken broth instead of 2 and Tex mex cheese for a bit of zip. Delicious and super easy! Your changes sound amazing, Kendel. Anyone tried with spaghetti squash instead of spaghetti noodles? I haven’t tried it with spaghetti squash but would love to know your results if you try it. Just what do you say about condensed milk or evaporated milk?In this recipe just wondering. Hi Ray! I haven’t made this recipe with evaporated milk, so I don’t know what the outcome would be. If you try it I’d love to hear your results. I don’t recommend using sweetened condensed milk in this recipe. Made this exactly like the recipe but added cooked mushrooms. I also sautéed the onions and green peppers before had. It came out delicious! Love the addition of mushrooms, Melissa! Aww bummer, Ambrose. I’m sorry your family didn’t enjoy the recipe. I made this the other day…I left out the green pepper as we aren’t big fans of them. I added 3 Tablespoons of cooking sherry and some pimento. It was amazing! I’m happy your family enjoyed Chicken Spaghetti as much as my family does, LAR. Made this today and my family and I loved it! So glad your family enjoyed it, DeAnn! Thanks for sharing your modifications, Jessica. The Rotel sounds like a tasty addition. I made this as written, used canned chicken (drained well) and added 4oz light cream cheese. It adds extra creaminess and flavor. Yum! Do you think this dish would freeze well? Maybe assemble it, then freeze and defrost and bake? I haven’t tried freezing this recipe. If you give it a try, I’d love to hear your results, Mary. I make mine almost exactly this way and always make enough for 2-3 meals. It freezes great! I use a gallon freezer bag and lay it flat in the freezer. It’s an awesome recipe! 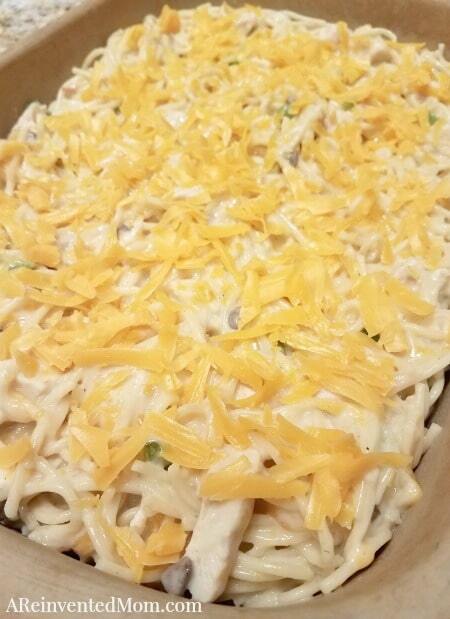 Thank you for sharing your experience with freezing this dish, Kimberly. 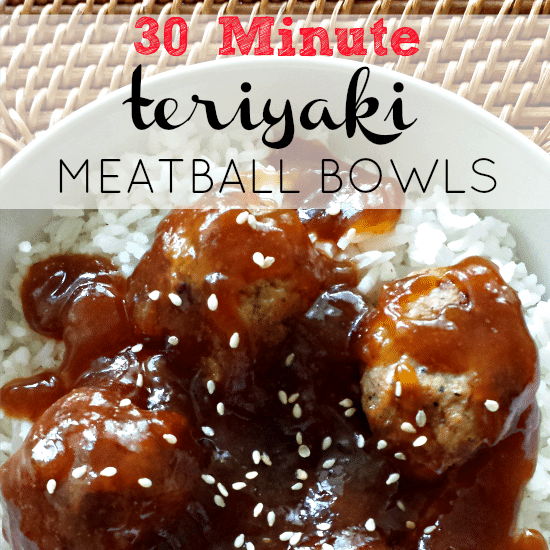 Could you make this in a crockpot.? 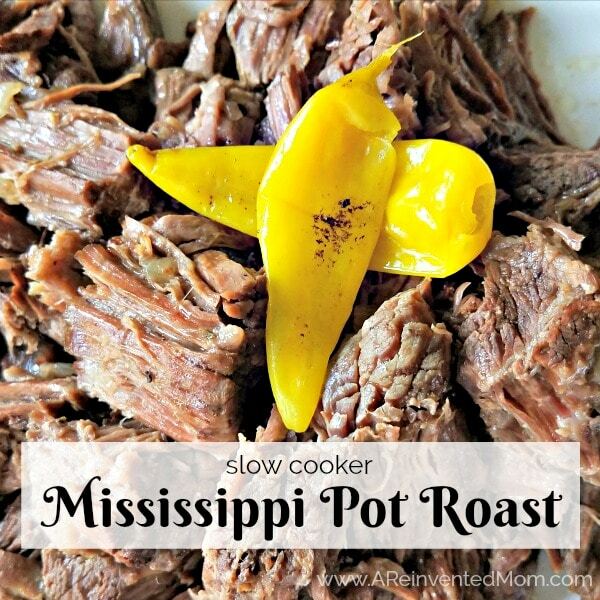 I haven’t made this in the crockpot, so I can’t say for certain. I’d love to hear your results if you give it a try, April. This looks sooo good. It’s in the oven right now! I used some leftover shredded chicken that had been cooked in stewed tomatoes and some yummy seasonings. I left out the onion and pepper since I didn’t have any on hand. I cooked my pasta in my Instant Pot and it turned out PERFECT. I had 3 partial bags of cheese so I mixed in a handful of quesadilla cheese, sharp cheddar, and Colby jack. Topped it with more Colby and a sprinkle of paprika. I had to snag a taste before I popped it in the oven. Tasty! And super easy. Love the blend of cheeses you used, Lauren. Sometimes you have to use what you have on hand. Thanks for stopping by! Can you use canned shredded chicken? You can absolutely use canned shredded chicken, Valerie. If you ever figure out what happened please let me know. So happy you’re going to try it again, Leslie. Thanks for your reply! I didn’t dilute them and used just 16oz of broth and did drain the pasta. I will definitely give it another try. It really did have a good flavor and was even better as leftovers! It had a really good flavor, but mine game out extremely watery, to the point I drained the liquid off twice! 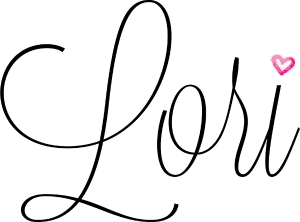 I made the recepie to a “t” any suggestion as to what I did wrong? I’m not exactly sure why yours came out watery, Leslie. The first things that come to mind are not draining the pasta before mixing or diluting the soups. This recipe uses the 10 1/2 oz. soup cans, Briana. Instead of cream of chicken can you substitute it with more chicken broth.. cream of anything has too much sodium??? I believe you would have better results if you used a homemade cream of chicken soup, Jadda. This dish looks delicious!! My only problem is that my family doesn’t eat cheese!! My husband and I eat cheese…so I was wondering if I could leave out the cheese and add it to mine and my husband’s after it’s cooked? What do you think? I think you would get better results by dividing the food between 2 smaller dishes before baking, allowing you to add cheese to one of the dishes. Thanks for stopping by, Angie! What kind of green pepper is in this? Green bell pepper, chili pepper? I use green bell pepper, Cynthia. Hey Lori! If I made this Thursday morning would it be okay to cook Friday or Saturday night? Taking a beach trip and everyone is bringing a premade dish for dinner one night! Hi Rachel! Would definitely be OK for Friday, but not sure about Sat. as I’ve never held this dish more than a day in the frig. A beach trip sounds really fun right now – we are forecasted for snow (yes, snow!) this weekend! I’m sorry I wasn’t able to respond until this morning. Yes, you will use a total of 2 cans of cream of chicken if you’re not using cream of mushroom. I hope you enjoyed this dish. Absolutely – Cream of Chicken will work well, too. Thanks for stopping by, Debby! I do not like mushrooms either but I was thinking of substituting it with a can of cream of celery. The cream of chicken also sounds good though. I would use either one just to try it out and see which I like best. The dish sounds like it would be easy to make and yummy to eat. Can’t wait to try it! Cream of celery should work well, too. I hope you enjoy this recipe, Rosie! Has anyone ever mentioned that the print is somewhat blurred. I printed out the Chicken Spaghetti. It looks scrumptious. Hopefully the blurred print does not affect other recipes. I hope you enjoy the Chicken Spaghetti recipe, Susan. You are the first to mention blurred print. Can you provide me with any additional details (i.e. what page is blurry? is it the print out that is blurry?) so I can look into the problem? My entire crew loves this dish, too, Kirsty. Thanks for stopping by!